It’s rare that a work of art entails genuine danger, but Martin’s Creed’s new sculpture is a billboard – sized, illuminated sign that rotates at increasing speed. 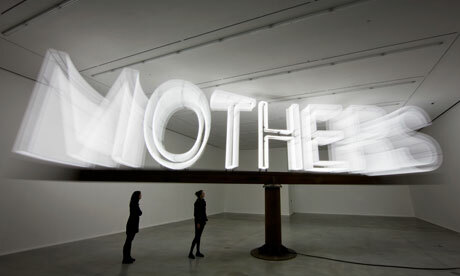 Giant neon letters construct the word ‘MOTHERS’, which illuminates the surrounding space with a harsh light. To step into this space is to risk significant injury, confirmed by a sign on the wall anxiously imploring us not to touch. This work demands a tentative encounter. Elevated by 2.03 metres, there is sufficient height to stand beneath the beam, but it is still low enough to instill serious trepidation. The absurdity of this object on a scale suitable for a Los Angeles Freeway is evident. Squeezed into an interior, the sheer physical impact of the sculpture is shocking and yet undeniably funny. With all its universal significance, the word here becomes a menacing and mesmerizing obstacle. This maternal surrogate literally threatens to give you a smack round the head. Our filial ambivalence is given discomforting, concrete form and we are compelled to survive this confrontation. To Ed Ruscha’s questioning the size of words, Creed replies that they can be as large as you want to build them. MOTHERS has an audacious self-sufficiency, but it is accompanied by work that might stem from another practice entirely. Creed paints geometric shapes and patterns onto small canvasses. Using wide brushes, he builds broad strokes of uniform or contrasting colours that narrow upwards like an stepped ziggurat. Elsewhere, he stacks thin and loose horizontal stripes in acrylic, enamel, ink, oil and watercolour pigment, meeting at varying lengths in a spectrum of blues or reds. Avoiding a finished quality, these small, raw paintings convey direct sensation and an aesthetic authenticity. Incongruously, three large photographs of a big hound and a tiny lapdog suddenly appear in the hang and interfere with any hint of seriality. The dissonance is intentional. Furthermore, a silent black and white film of closely cropped female breast floats in a dark room without any apparent relationship to the adjacent work. Creed’s disavowal of linked scale, subject and media is, he explains, a conscious enjoyment of freedom and a denial of expectations. However, such an exhibition strategy runs the risk of upstaging the value of the works themselves, which tend to embody a brave and playful artistic enquiry.